After several days of paddling and camping in the fjords we headed North into Jotunheimen National Park, the highest mountain region in Norway. The drive here was spectacular and felt like something you should not be able to reach by such easy means as a paved road. 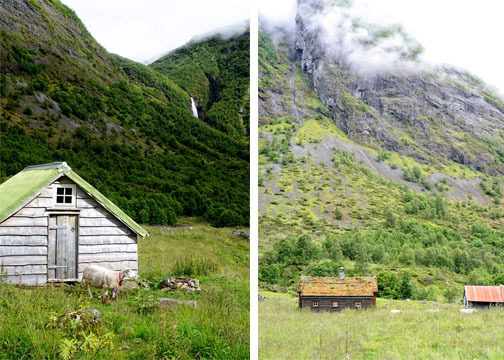 We spent one night at the Elveseter Hotel before the big climb up Norway's tallest peak, Galdhøpiggen. Galdhøpiggen is 2469 meters above sea level, but you can drive up to the ski area at 1850 meters so the climb is not bad. We set out in dense fog and the forecast called for thunderstorms. I worried we wouldn't be able to see anything at the top after all that work (or that I would be struck by lightning and die), but we got some blue skies to keep our spirits up and the storm held out. 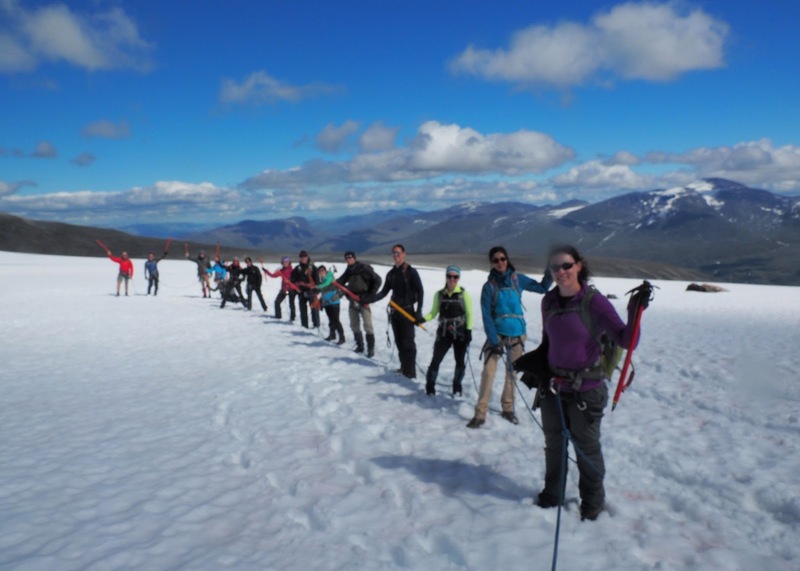 Part of this climb requires roping up to cross a glacier which added to the sense of adventure. There were also a lot of boulders and some slippery snowfields. While overall the hike was not as challenging as others we had done on this trip, it was still not exactly easy. We were one of the first groups out that morning and got the summit mostly to ourselves. On the way down we could see groups like marching ants working there way up. It got very crowded and I was so happy that we had beat the crowds at the top. This was one of the highlights of our trip. The view was beautiful and we had a blast conquering the tallest peak in Norway! 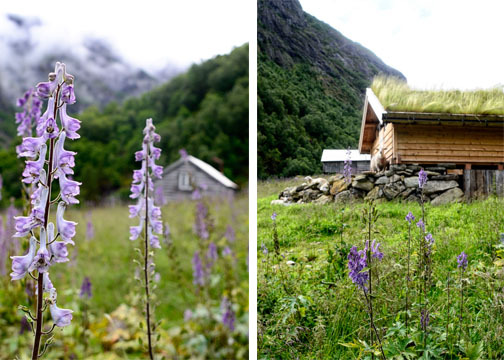 Our hosts at Stigen, Dee and Hege, have another house in the village of Fresvik. We stayed in their "city" home after our night in Stigen, which meant another evening with wood fired hot tubs and an incredible meal. This home also had showers and flushing toilets after several days and nights without, so it was extra nice! 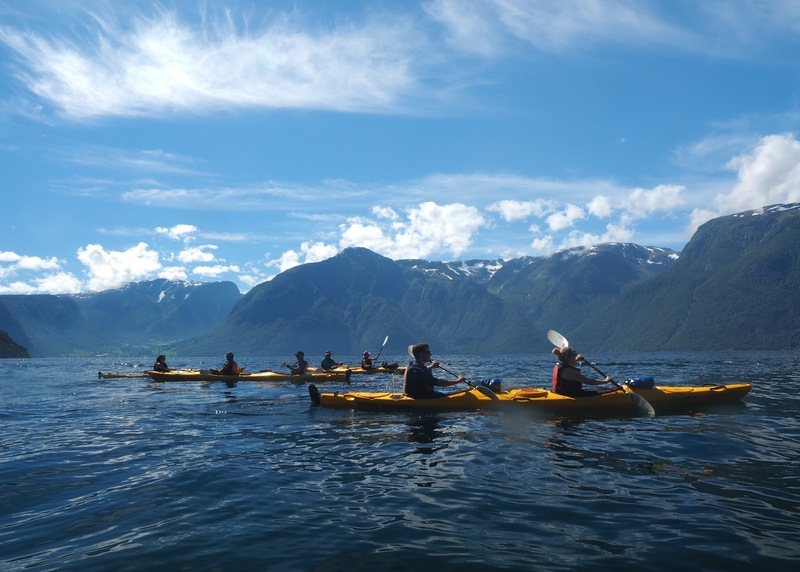 To get here we kayaked through the Aurlandsfjord into the Sognefjord. 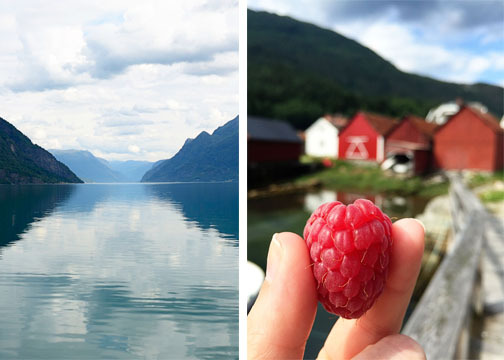 The village is nestled between beautiful green mountains right along the fjord. We enjoyed walking around looking at houses, raspberry farms, and historic photos of the people who lived in the tiny village. When it was time to leave Fresvik and venture out for our last day of kayaking, we lucked out with gorgeous blue skies and sunshine. Weather like this felt extra special after the "liquid sunshine" we had experienced on most days (this is how our guide Nic referred to the rain). We had a nice leisurely day of paddling and could really soak in the beauty of the area. When it was time to pull out, we found fresh fruit and glasses of sparkling wine waiting for us. Such a treat! After two nights in the Nærøyfjord we entered the Aurlandsfjord. Our third night of camping required pulling our kayaks up onto a narrow beach and climbing straight up a cliff. Part of the trail had been blasted out of rock. This was goat country, y'all. Those with a fear of heights (me) had no choice but up, for there lay not only our beds for the night but wood stove "hot tubs". Think about it...rain and no showers for days...there were tubs full of hot water at the top...! I was able to take on those cliff-side switchbacks. It was SO worth it. At the top was the most beautiful fairy tale of a farm, Stigen. The first joy I experienced was finding an outhouse that was clean and did not stink. What wonders had I stumbled upon?! There was even a urinal on the cliff's edge (pictured somewhere below) - a loo with a view. Our hosts greeted us warmly. Dee told stories while Hege washed up the lettuces harvested from their garden that afternoon. We hit the hot tubs immediately. Joe, Brian and I shared the little tub on the actual edge of a cliff. 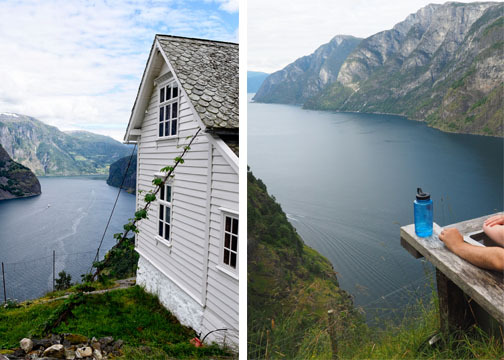 The fjord lay below us and I was able to wash my hair with a watering can full of wood stove heated water! Dee and Hege's houses were snug and cozy. 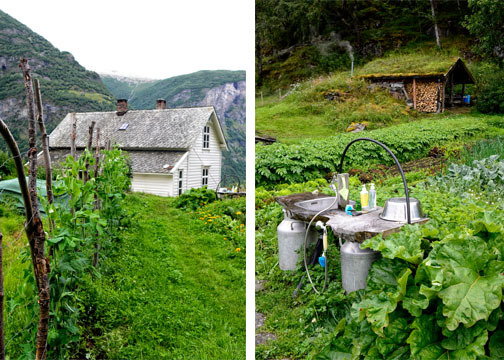 They served us the most amazing dinner that was all from their farm on the cliff above the fjord. We were warm, we were clean, we were full of good food, and we were entertained with stories of life in Norway and the funny visitors to the farm over the years. I remember I got up in the middle of the night to visit the outhouse and it still was not dark outside. Everything glowed. It was just the most beautiful place. In the morning some of us woke at dawn to hike up to Beitelen. From there we had a view down both sides of the Aurlandsfjord and back up the Nærøyfjord. We made it back for breakfast just as it began to rain again. 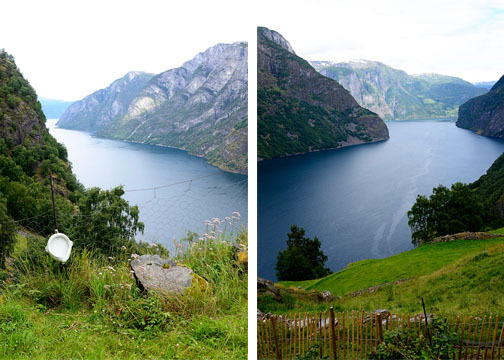 Of all the places we visited in Norway, the Nærøyfjord was the most beautiful. It is a UNESCO world heritage site and we were able to kayak through over the course of a couple days. 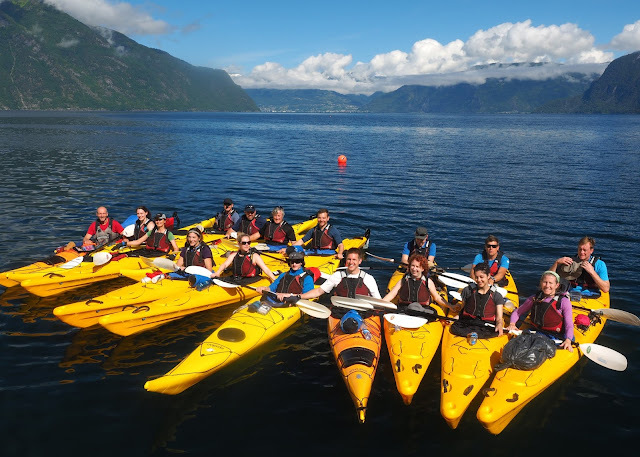 The company running the tour, Nordic Ventures, is based at one end so it is easy to do a kayak tour with them even just for a day if you're in the area (and you really should make a point to be in the area). 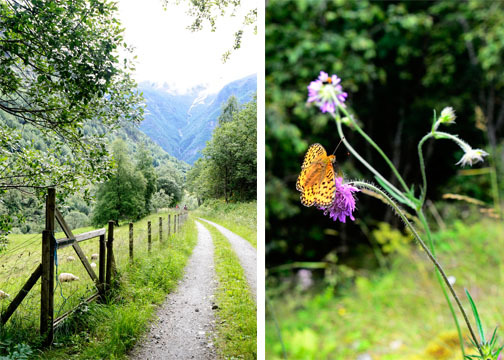 Our journey began in Gudvangen as we rifled through our luggage to determine what we would need for four days of camping in the rain. We donned our wetsuits and neoprene booties and got used to the idea of being wet and warm at the same time. I will tell you that after the four days, I laughed at the fact that I cared that my booties were smelly on day one. Being in the outdoors tends to remind us of what matters and what our priorities should be centered on. Our first break while kayaking through the fjord just happened to be on the site of a Viking burial mound. There were also sheep! Sitting there eating my sandwich in this setting seemed surreal and magical. 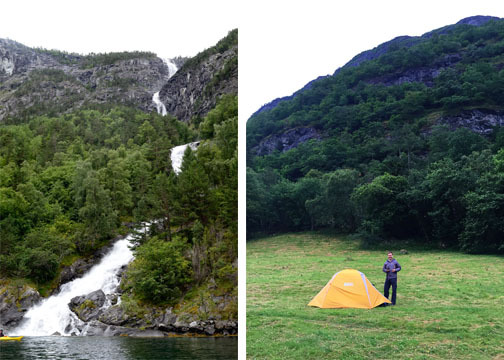 We camped on the shore of the fjord that first night. Setting up camp in the rain was made easier thanks to the REI half-dome (my tent! I know how to set this one up!) and blue tarps mounted on kayak paddles. Our guides made a feast and a boat delivered not only bottles of wine, but actual glasses to enjoy it from. Camping in the wind and rain with actual glasses of wine...what a great balance. Due to the weather I have very few photos of this beautiful place. Just imagine paddling with the current through green mountains, cascading waterfalls, and quaint, tiny farms. This is a place that you just have to experience first hand. Trolltunga is a very famous hike in Norway, and that became apparent as soon as we hit the trail. This place was Disneyland levels of crowded. The beautiful weather we had on yesterday's hike was gone, and we set off on a slog through rain, mist, and mud. This trek started with an incredible amount of elevation gain in the first kilometer, so that we were essentially ascending slippery rock stairs and slopes of mud with ropes. We did all of this in a line of constant hikers, like a few of many marching ants. I cannot imagine what this place is like on a sunny day! This hike felt especially challenging since it was our third day of hiking, it was pretty long (23 kilometers round trip), and the weather was miserable. We made it to the end but only stopped for a quick selfie before heading back down. There was a huge line of people waiting to have their photo taken on the actual "tongue", but this was good enough for us! Of course, as soon as we got back to the parking lot the sun came out. Our guides bought us beers and we were able to dry out a bit. This was the one hike of the trip that none of us were crazy about because of the crowds. I feel like this one could be skipped unless you happen to have stunning weather and don't mind the lack of solitude.